Homelessness is a common idea of Detroit that many people hold, but what does the data really show? The Homeless Action Network of Detroit (also serving Highland Park and Hamtramck) publishes an annual report based on the people that they have worked with throughout the year. The best metric that they have is of individuals who report being homeless and the zipcode of their last residence. 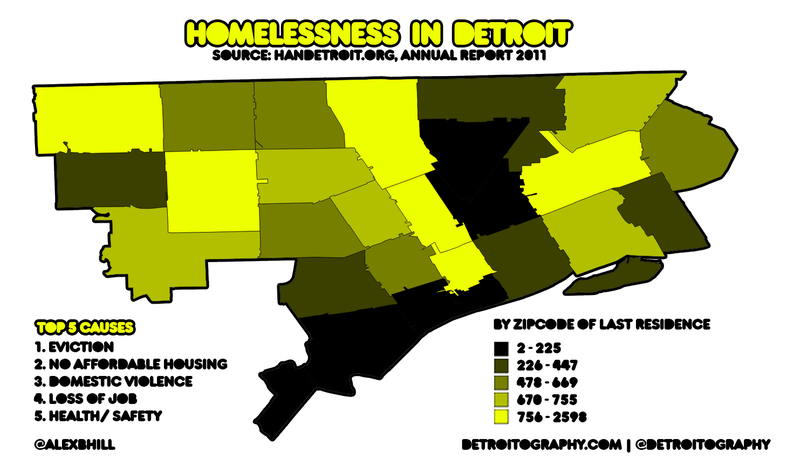 The vast majority of individuals that HAN Detroit sees have been homeless more than once and most for more than 2 years. Counting a population of homeless individuals will never be accurate or easy. This is just one example of an organization that works with 74 member organizations across the city and likely has a pretty good dataset. What is most surprising about this data is that “eviction” and “no affordable housing” were the top 2 reasons for homelessness. The concentration of the most people reporting homelessness followed the Woodward corridor. I’m not sure if there is any real correlation there, but it isn’t surprising that a main area for renewed economic development would potentially be causing an increase in homelessness.